Utilizing advanced optical and microprocessor technology, ProScan produces a linearized 4-20 mA output that can be tailored to a wide range of applications. The sensor attaches directly to the process line and allows real-time, in-line analysis of fluid streams. The sapphire lens and 316 stainless steel body will withstand the high temperatures, rapid temperature fluctuations and chemical agents typical in food and pharmaceutical processes. 1-1/2", 2", 2-1/2", and 3"
Utilizing advanced optical and microprocessor technology, ProScan produces a linearized 4-20 mA output that can be tailored to a wide range of applications. The sensor attaches directly to the process line and allows real-time, in-line analysis of fluid streams. The sapphire lens and 316 stainless steel construction will withstand the high temperatures, rapid temperature fluctuations and chemical agents typical in food and pharmaceutical processes. The simple design allows plant personnel to install, tune and maintain it with ease. ProScan can be installed virtually anywhere in the production or waste stream where it is important to detect process interfaces, monitor turbidity or measure product concentrations. In pasteurizer lines, a popular installation site is downstream of the HTST. The ProScan signal can be used to switch valves and direct the liquid stream to the filler, recirculate it or divert to drain. ProScan is also a valuable tool to control CIP pre rinse cycles and maximize product recovery. The simple NIR sensor helps processors recover as much product as possible before initiating cleaning and helps to ensure expensive chemicals are added at the appropriate time. In addition, ProScan can act as an excellent monitor of BOD loading on waste lines. From receiving lines and pasteurizing lines to filling lines and waste lines, ProScan offers an economical solution to your process control needs. 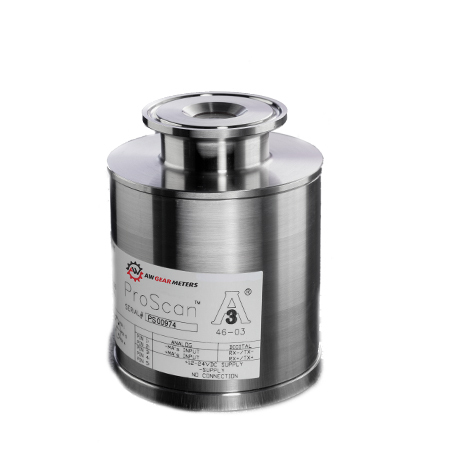 Highly Accurate: The ProScan sensor utilizes NIR technology to accurately and instantly detect product transitions, monitor turbidity and measure product concentrations at all stages of your liquid process. Non-Intrusive Monitoring: Utilizing advanced optical technology, ProScan sends a beam of light into the process and measures the backscatter. The intensity of this scatter is proportional to solids concentration. Improved Automation: ProScan acts as an eye in your process to allow real-time process control and enable improved product quality, productivity and ROI.